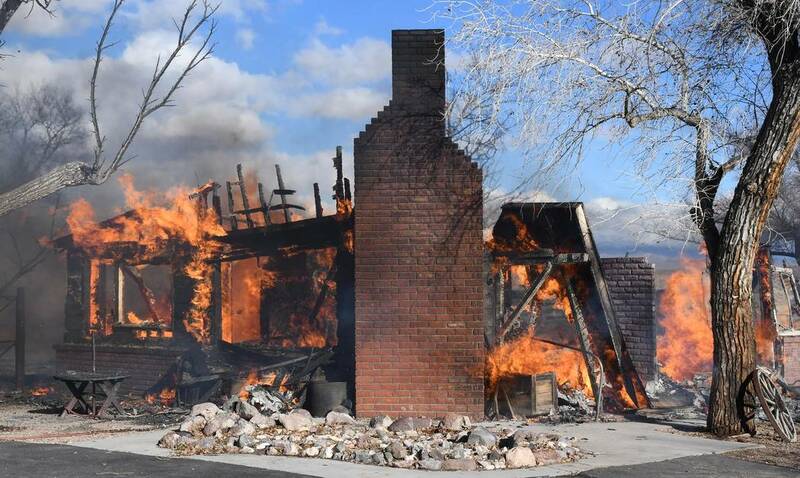 A piece of Nevada history went up in smoke Feb. 4, as a house and adjoining cabin in Springdale, ten miles north of Beatty, burned to the ground. Richard Stephens/Special to the Pahrump Valley Times The Beatty Volunteer Fire Dept. enlisted aid from the Amargosa Volunteer Fire Department and from the Bureau of Land Management. Amargosa sent two tenders and an engine. 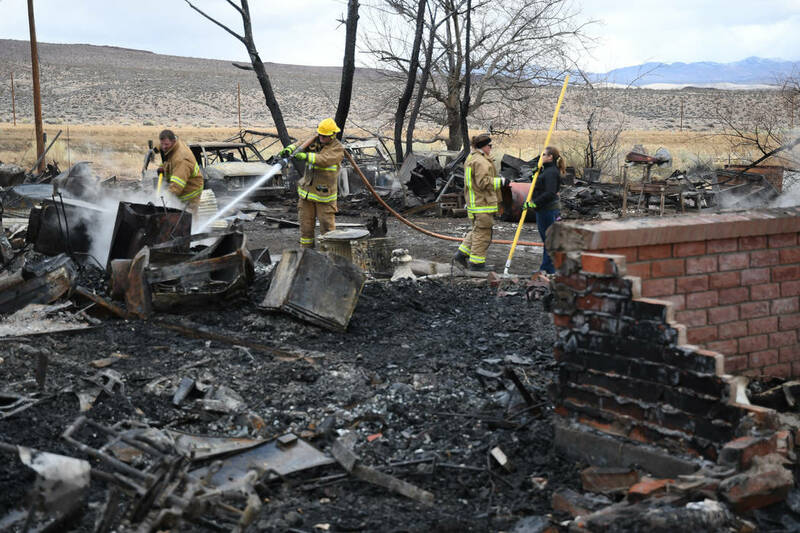 Richard Stephens/Special to the Pahrump Valley Times Beatty firefighters were called to the scene again the next morning by State Fire Marshal Investigator Michael Kolpak, who discovered some flare-ups in the debris. They spent another hour and a half stirring and soaking the material. By the time the Beatty Volunteer Fire Department arrived on the scene, little was left of the cabin, and the main house was totally engulfed in flames. They called for aid from the Amargosa Volunteer Fire Department and from the Bureau of Land Management, which has jurisdiction over adjoining land. Amargosa sent two tenders and an engine. Harmon said the tenders were especially welcome since their biggest need was for water. The BLM sent an engine with a couple of wildfire firefighters. They spent the night on the property guarding against flare-ups. Beatty firefighters were called to the scene again the next morning by State Fire Marshal Investigator Michael Kolpak, who discovered some flare-ups in the debris. They spent another hour and a half stirring and soaking the material. Although the property is currently owned by Larry Moog, longtime Beatty residents remember the ranch as the residence of former Beatty builder and salvage dealer Ed Peacock, who was killed in a highway accident in 2002. Peacock’s son, Ross, of Redding, California, says his grandmother was the family member who originally bought the property back in the early ’50s. She was driving from Las Vegas to Reno and was just passing the place when she saw a “for sale” sign being put up. She doubled back and made an offer. Ross says his grandmother, Lucille, was a no-nonsense woman who “was way ahead of her time.” She operated a small store and restaurant in the building, and it became a popular truck stop. Ed and Peggy Peacock moved to Springdale in 1954. Originally, the family lived in a nine-room house across the old highway from the restaurant, but that burned down in the late ’50s or early ’60s. When Ed was remodeling the building which was now his residence, he was told that when he was tearing into the wall to put in windows he’d find red flocked paper, and he did. This was wall decor from its earlier history – a saloon and dance hall. The first residents in the Springdale area, were, of course, Native Americans. It was something of an oasis, with plentiful water and vegetation. Eventually, there were a few ranches, and in 1905 Albert J. “Lucky” Tidwell established Springdale as a town. It was a stop for the Bullfrog-Goldfield and Tonopah and Tidewater railroads, supplying the wood and water steam engines ran on. At its peak, the town had a post office and a school and something approaching 300 residents. It was a player in the Pioneer mining district, having a 50-ton mill for processing ore. It also had saloons, restaurants, and at least one brothel. The town’s decline started in 1911 when the mill closed. The railroad stopped running in 1928, and the depot was dismantled. Motorists today do not pass through Springdale. A remnant of the old highway still runs through it, but modern Highway 95 passes right by it.